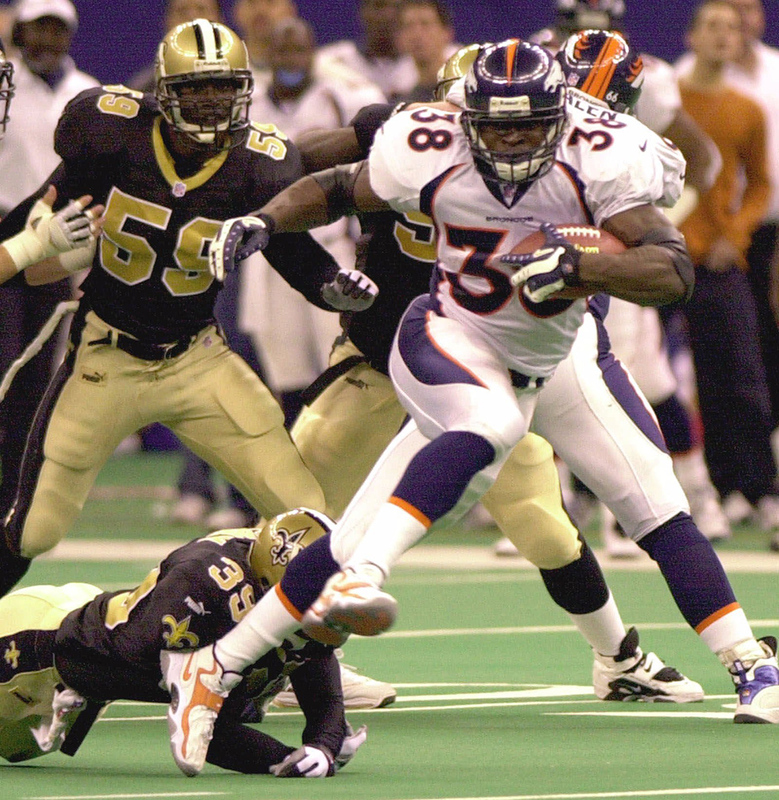 Denver Broncos running back Mike Anderson (38) breaks up the middle for a touchdown as New Orleans Saints defenders Darren Perry (39) and Keith Mitchell (59) try to stop him during 2nd quarter NFL action in the Louisiana Superdome in New Orleans on Sunday, December 3, 2000. Anderson ran 37 times for 251 yards and four touchdowns Sunday, breaking the NFL rookie rushing record in the Broncos’ 38-23 victory. Mike Anderson rushes for 251 yards in a 38-23 win at New Orleans to set an all-time NFL rookie rushing record for a single game. He also broke the franchise single-game rushing mark by posting the fourth best rush- ing day by any player in NFL history, and set a Broncos record with four touchdowns in the game. Jason Elam also set an NFL record, converting his 304th consecutive point-after attempt, breaking Norm Johnson’s previous record of 303.